American theatrical manager; brother of Charles Frohman; born at Sandusky, Ohio, 1853. 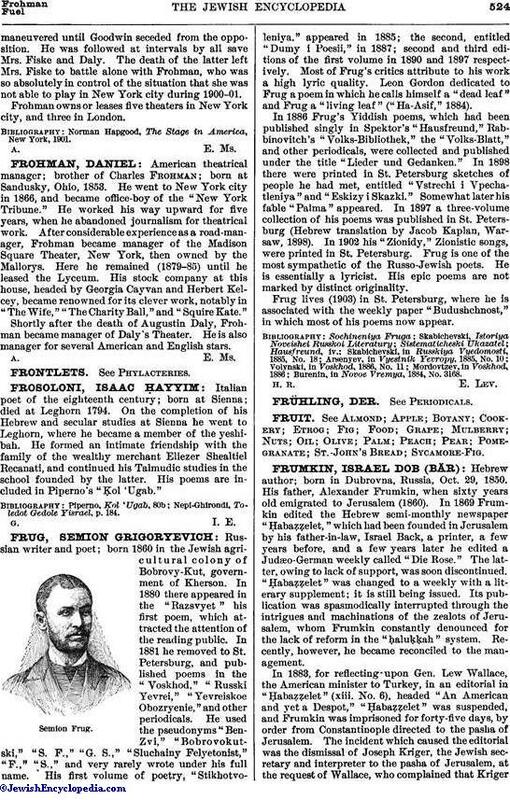 He went to New York city in 1866, and became office-boy of the "New York Tribune." He worked his way upward for five years, when he abandoned journalism for theatrical work. After considerable experience as a road-manager, Frohman became manager of the Madison Square Theater, New York, then owned by the Mallorys. Here he remained (1879-85) until he leased the Lyceum. His stock company at this house, headed by Georgia Cayvan and Herbert Kelcey, became renowned for its clever work, notably in "The Wife," "The Charity Ball," and "Squire Kate." Shortly after the death of Augustin Daly, Frohman became manager of Daly's Theater. He is also manager for several American and English stars.